Martyn Bunce (left) and Dennis Greene. Dennis Greene is tipping Martyn Bunce for a bright future in management as the pair go head-to-head in opposing dug-outs for the first time tonight. 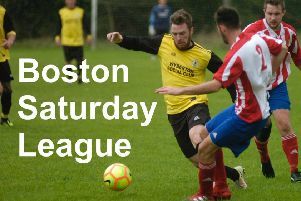 Boston Town and Skegness Town will end their pre-season schedules at the DWB Stadium this evening. Greene and Bunce enjoyed success as manager and assistant at Boston United, but this evening they will take charge of the Poachers and Lilywhites respectively. “Bunny’s got everything you need to be a good manager,” Greene told The Standard. “He’s got his UEFA B badge, he knows what it takes to do well in football and he’s got plenty of experience. “We got to two play-offs in the National League North. He did well with Adam Murray at Boston United after that and he’s won things with the under 18s there. Bunce is also looking forward to locking horns with Greene, although he says getting one over his former boss isn’t on his mind. “It’s pre-season and that’s all about getting your team ready,” he said. Kick off will be at 7.45pm.